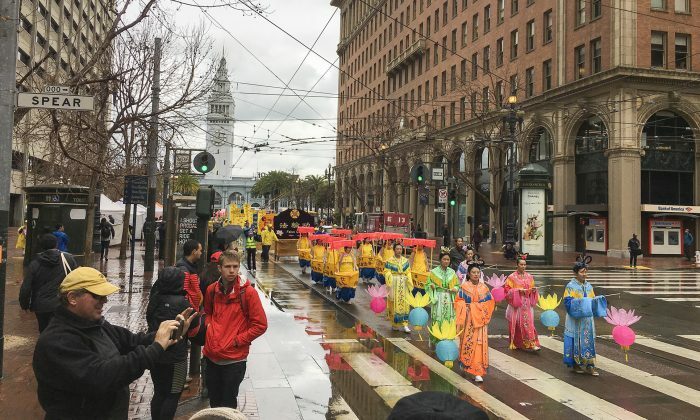 SAN FRANCISCO, Calif.—Despite the cold, rainy weather, hundreds of Falun Dafa practitioners from all over the Bay Area marched in San Francisco to celebrate Chinese New Year. The Tianguo marching band led the parade starting at the Embarcadero and Ferry Building. Next was the dragon dance followed by a group of heavenly maidens, a group demonstrating Falun Dafa’s qigong exercises, a variety of China’s different folk and ethnic groups, and vivid banners. They all made their way through downtown San Francisco on Feb. 9, ending up at Portsmouth Square. 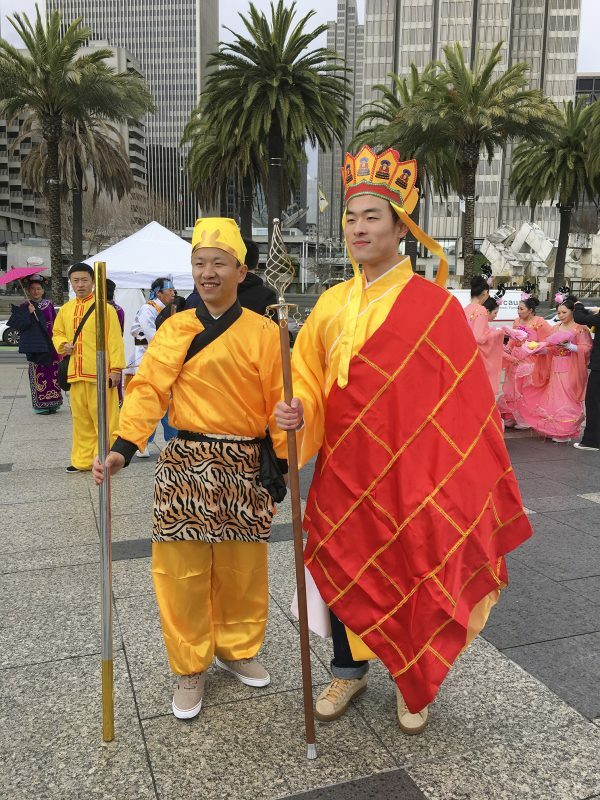 Kerry Huang, the event coordinator, explained that Falun Dafa practitioners were hosting this parade because they want to make sure that traditional Chinese culture is not lost overseas among the Chinese diaspora, as it has been attacked and much of it destroyed in modern China. “Over many years, a lot of people have forgotten what is traditional culture. They only remember to celebrate, but the part about exorcising evil and traditional culture is lost,” she said. David Huang, a Falun Dafa practitioner who portrayed the Monkey King from a Chinese classic, Journey to the West, explained the significance of his character. 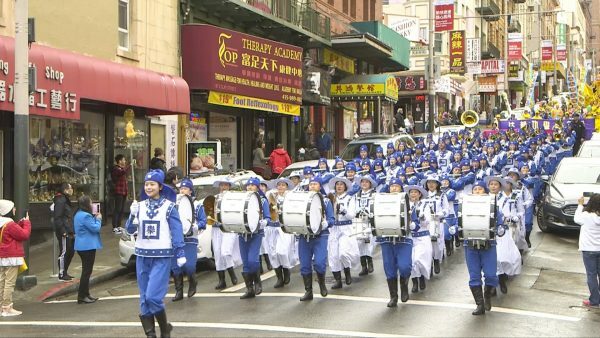 Guided by age-old traditions, Huang said that the beauty of the Falun Dafa parade was a great celebration of the New Year bringing blessings to San Francisco residents. Falun Dafa, also known as Falun Gong, is a peaceful meditation practice that consists of five sets exercises. Based on its teachings, practitioners live by Truthfulness, Compassion, and Tolerance in their everyday lives. Dan Ngo has been a Falun Dafa practitioner for two years and said it has changed his life. His family of five are also practicing. “Everything I do, we have to follow the righteous thought, the right way, and everything I do, my work, everything it just revolves around it. It’s nothing but pleasure,” Ngo said. The practice was first introduced in 1992 by Li Hongzhi in China. In a few years, millions across the country were practicing. However, starting 1999, the Chinese Communist Party (CCP) became afraid of the growing number of Chinese who practiced Falun Dafa and started to persecute them. Many were tortured to death or have had their organs harvested while they are still alive, all because their spiritual belief was banned by the CCP. Those who have been able to flee the country have been able to freely continue with their spiritual practice overseas. They have also been the only way the outside world has come to know of the barbaric genocide is happening to Falun Dafa practitioners in communist China. But even overseas, the murderous CCP still attempts to persecute the practice in different ways. 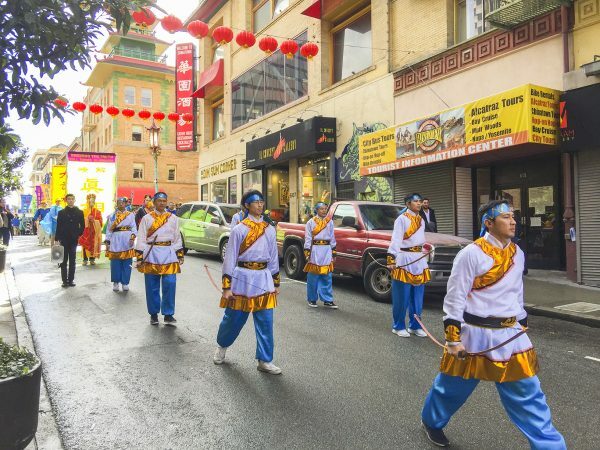 Due to pressure from the CCP, the Chinese Chamber of Commerce banned the meditation group from participating in the city’s annual Chinese New Year parade in 2005. Since then, they have not been able to participate. 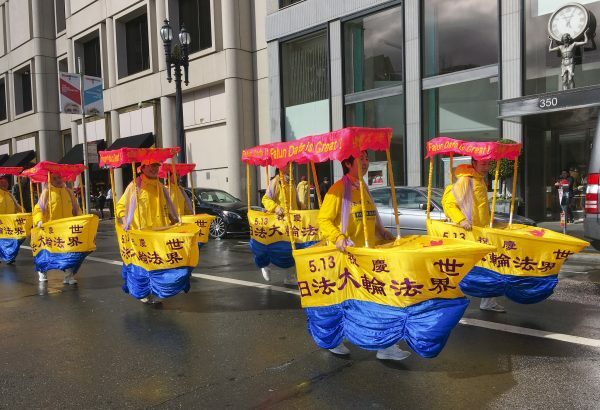 Therefore, practitioners from around the Bay Area put on their own parade each year to celebrate with the locals and let the CCP know that Falun Dafa still thrives. Antonio Gonzalez, a parade spectator from Spain, was sad to hear that even overseas, the group is still being discriminated against due to CCP pressure.